These delicious, cool pops are definitely something to blog home about. Courtesy of Best Recipes Ever. 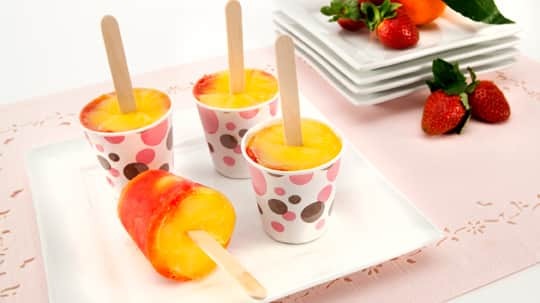 After the kids help put these refreshing fruit-filled treats together, they'll want to create their own flavour variations with different fruit and sherbets. In food processor or blender, purée strawberries with sugar until smooth. Spoon half into eight 5 oz (147 mL) paper cups; spoon half of the sherbet over top. Top with remaining strawberries and sherbet. Cover with plastic wrap. Peel away paper cup and plastic wrap before serving. Makes 8 servings.